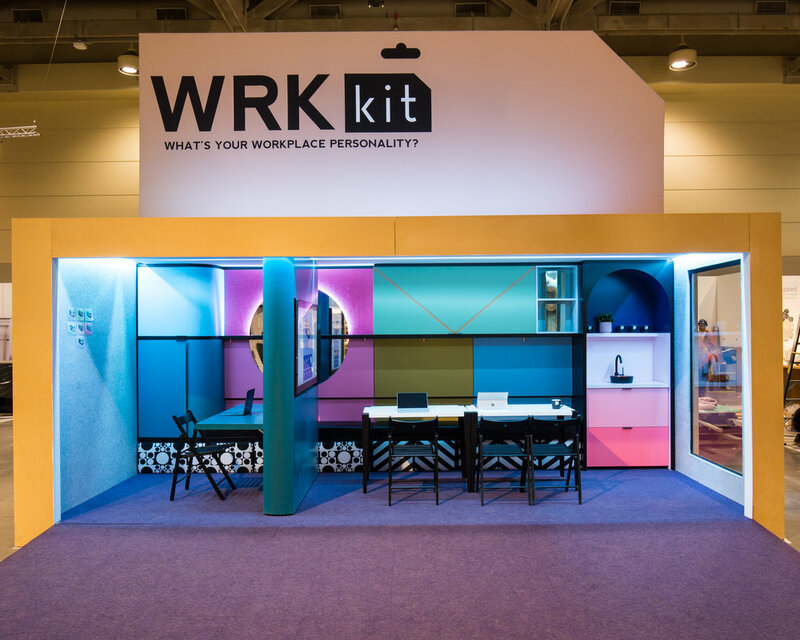 SDI Design have brought to life a concept of configuring an office space according to a person’s workplace personality, using a life-size kit of components. The Canadian design firm presented the WRKkit concept at IDS Toronto using a giant container to showcase their modular workplace furniture, and the moving elements of the space in action. 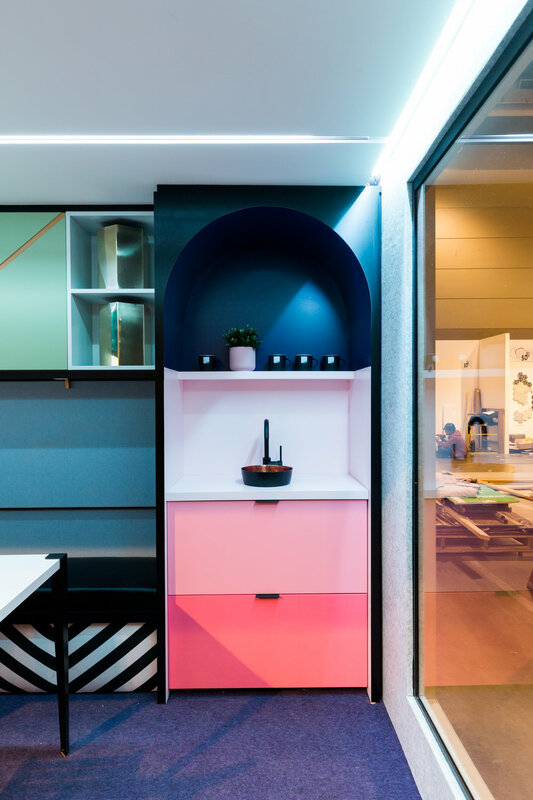 What I think is so cool about this concept is the ability to have a bespoke office solution that speaks to not only one way of working style, but several. With the option to shape your space according to your working patterns and behaviours, it demonstrates the frequent shift and adaptability required in a space to allow the workplace to work best for their users. 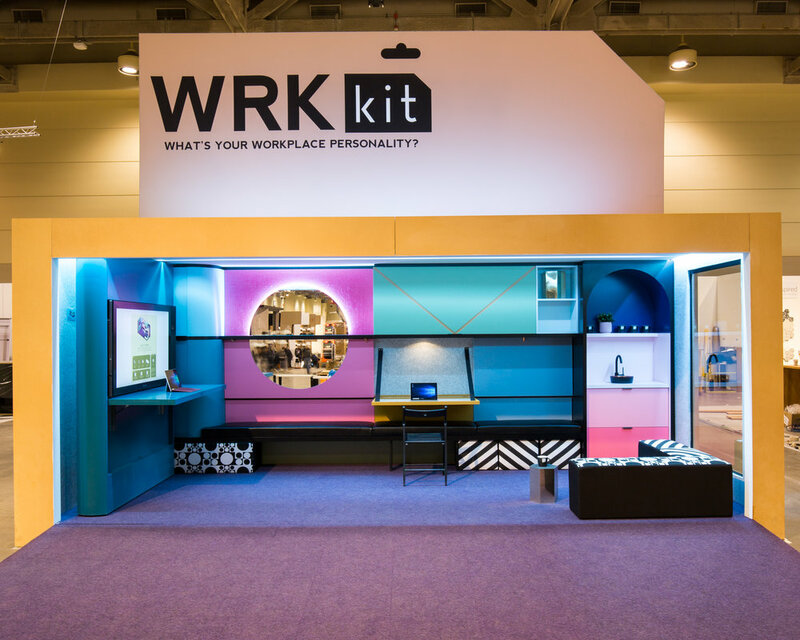 Various patterned and colourful components were shifted during the installation at IDS Toronto, such as fold out tables, kitchen appliances and partitioned areas. Foldable desks make for an ideal solution for hot desking or when additional workspace is required. 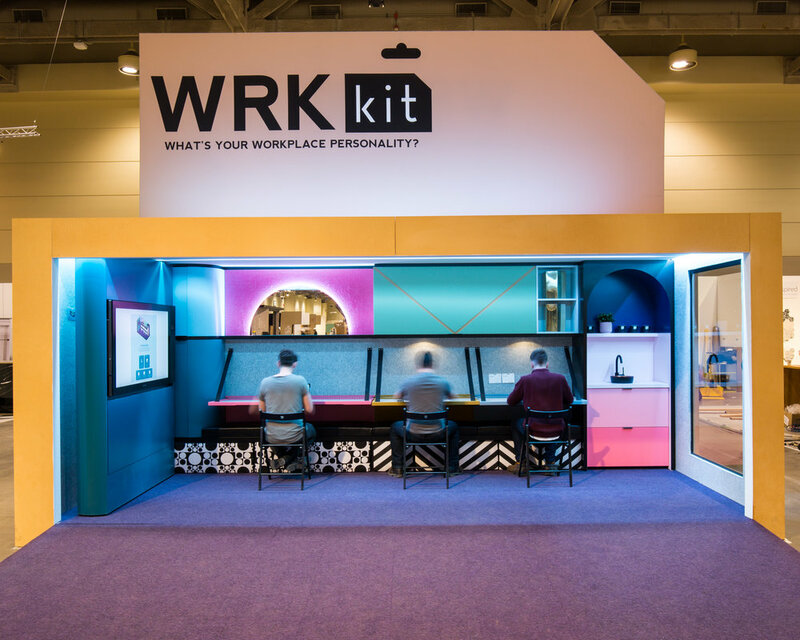 SDI, in collaboration with Microsoft were able to develop a personality test for people to take to determine their ‘workplace personality’, resulting in them receiving guidance on the configuration that would work best for them using the WRKkit system. And the lie detector test determined that … IT WAS NOT A LIE! I am quite impressed by the accuracy of the description for me as a creative, but also the activities identified in my own personal summary. I think the tool was able to describe to a T how I work and all of the things that I need sufficient space and resource for. Here’s a look at my summary in detail. The WRKkit personality test matched me to the best configuration based on the types of things I do and need space for, and suggested the parts I’d need to bring this to life in my own WRKkit office solution. I was also provided with some modelling on what the solution would look like if I were to proceed with having it designed, which of course, could be tailored even further on request. A drawing of my own personalised WRKkit flexible office solution. Pretty impressive right? I love the partition down the middle which can also be drawn back to open out the space. 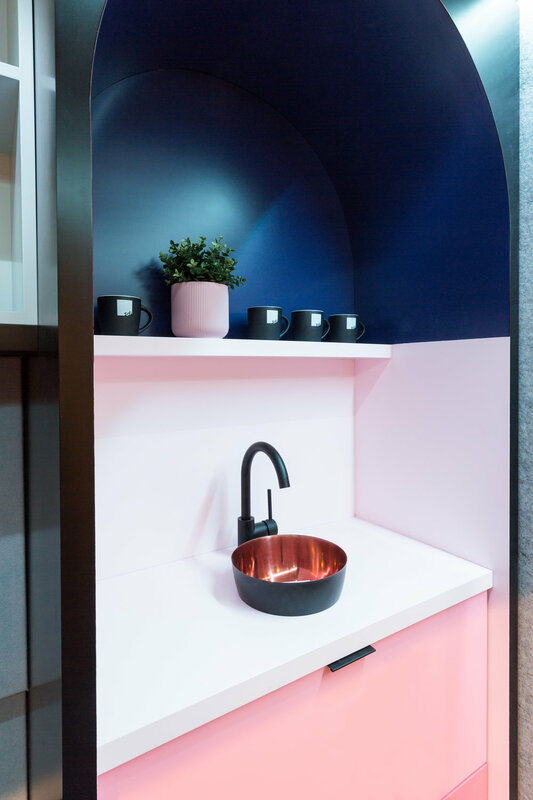 I am also impressed with the combination of colour and modularity as a whole and definitely think it would add value to the creative work industry. Want to determine your own workplace personality? Take the test here. For now, I’ll leave you with some more beautiful visuals of the adaptable space for you to drool over! The partition is ideal for lone working or when more privacy is needed. Built in kitchen appliances or basins can also be factored into the design, making the solution an almost all encompassing solution. The space also demonstrates being able to accommodate comfort or relaxation zones when you need some time to disconnect. Various seating and breakout areas can be formed to facilitate discussions if needed. Love the downlights above the seating area (which looks like a sick nap zone might I add). Featuring pink walls and hues of blue, the WRKkit office space is to my exact tastes in design and they definitely haven’t saved on the detail. The electrical ports also move as the space does which could make for very ideal and convenient socket powering when needed. Anyway guys, overall, I am super impressed with the concept as a whole and would love an adaptable, portable space designed just like this for myself one day. Great job guys!